It was one hell of a match between Chennai Super Kings (CSK) and Kolkata Knight Riders (KKR) at the city's Chepauk stadium yesterday. With this win, CSK has claimed the top spot in the IPL 2019 points table. By the end of this game, two biggest and most loved superstars of the country MS Dhoni and Shah Rukh Khan, were captured in one frame where this became a complete treat to the eyes for all fans! 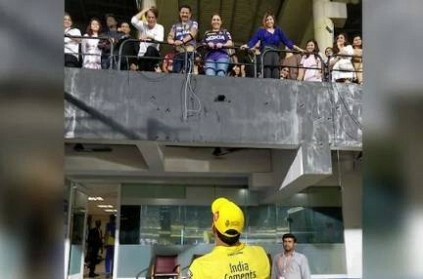 Taking to social media, CSK's official Twitter handle posted a picture where the Bollywood King Khan, can be seen talking to CSK Captain Dhoni, who was down on the field. They captioned it saying, "#Thala, Chennai Express Super!#WhistlePodu #Yellove #CSKvKKR." This picture turned out to be the click that fans had been waiting for as it went viral within minutes. Some fans commented on it saying, "Picture of the day", "One is King and another is Magician" with many more. CSK defeated KKR by seven wickets and has currently hit the top spot. Starc sues $1.53 million after missing IPL !!! This page contains news relating to various facts and events. The views are generally about current affiars and general topics in diversified areas such as political, international, national, and regional issues, sports, health, travel, lifestyle, technology and business. People having similar interets on the above topics will find this page useful. MS Dhoni, Shah Rukh Khan and Atlee Kumar Captured In One Frame Duri | Sports News.